An event organisers known as Minhaj-ul-Quran International say some 12,000 Muslims are expected at Wembley Arena. The event will be broadcast live to dozens of countries around the world. 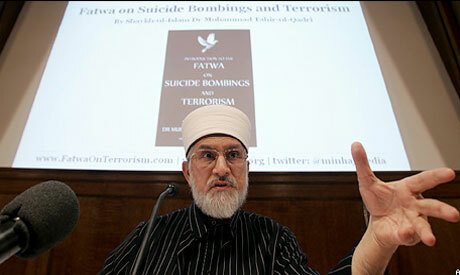 The group's founder, the Pakistan-born Islamic scholar Muhammad Tahir-ul-Qadri, says killing innocents is forbidden in Islam and Muslims must integrate into the societies in which they're living. Some Islamic scholars like Tahir-ul-Qadri have warned that a power vacuum in North Africa and the Middle East could lead to militant and extremist groups gaining ground in upcoming elections caused by the so-called Arab Spring. Minhaj-ul-Quran International says it represents a moderate vision of Islam that works for peace and integration. Later Saturday, the rally will feature what it calls a collective peace prayer, led by religious leaders of Hindus, Buddhists, Christians and other major faiths. Britain has been involved in some of the largest international terror plots. On 7 July, 2005, four suicide bombers killed 52 people in synchronised attacks on London's subway system. The men behind the 2006 trans-Atlantic liquid bomb plot began their plan in Britain. A Nigerian man, who tried to smuggle explosives onto a plane in his underwear studied in London.